Shiryu Music: Holy Toledo! Rock'n'Roll'n'Racing Drops! The stage is set, the green flag drops! Shiryu unleashes hot fury... tomorrow when my latest video game tribute LP is released WWWide. But you fine TAY folks can grab "Rock'n'Roll'n'Racing" right now from the links below. I have been meaning to do this one for years, but I always have trouble with virtual guitar and it was hard to get this done in a way I found acceptable in relation to the fantastic originals. So I hope you enjoy this new 16 track album, featuring 8 regular versions and 8 chiptune versions of the several classic rock themes form the game, including an extra bonus theme from The Doors sung by none other then Animal Crossing's very own K.K. Slider! 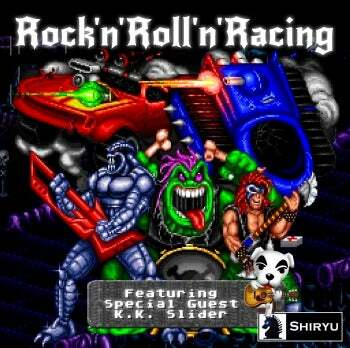 In case you are too young or you just don't recall this particular, brilliant game by Blizzard, my retro gaming project Shiryu & F81 series has just reached episode 30 and we just played... yep, you guessed it, "Rock 'n' Roll Racing" on Super Nintendo!